Plate roll bending machine is a machine tool for continuous bending of the plate, with the function of rolling O-type, U-shaped, multi-segment R and other different shapes of the plate. 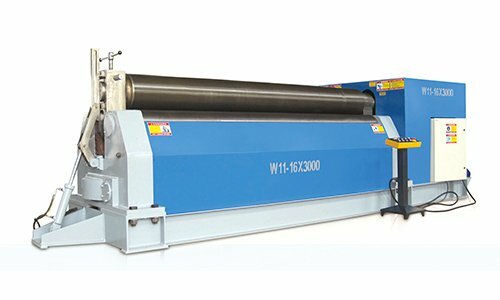 The roll bending machine has the mechanical and the hydraulic type. Plate roll bending machine also been called plate rolling machine or plate bending machine. 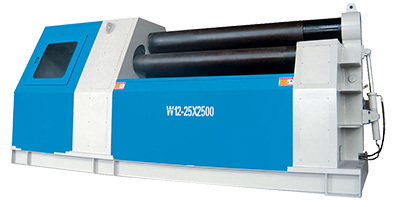 The upper roller of symmetrical plate rolling machine does vertical movement at the center of two lower rollers via the hydraulic oil in the cylinder acting on the piston. Through the final reduction gear of the main reducer to drive two lower roller gearing and make the rotary motion, to provide torque for the rolling plate. The flattened plastic sheet of metal is passed between the three work rolls (two lower rollers and one upper roll) of the rolling machine, and by means of the upper roller’s press and lower roller’s rotary to realize continuous bending (inner layer compression deformation, the middle remains the same, the outer stretch deformation), which resulting in permanent plastic deformation. The metal sheet is rolled into the required cylinder, cone etc. The disadvantage of the hydraulic three-roller bending machine is that the pre-bending of the end of the plate need with the help of other equipment. The plate rolling machine is suitable for large roll bending machine with the thickness of 50mm or more. The bottom part of the lower roller is added with a row of fixed rollers to shorten the span of the two rollers, thus improving the precision of the workpiece and the overall performance of the machine. 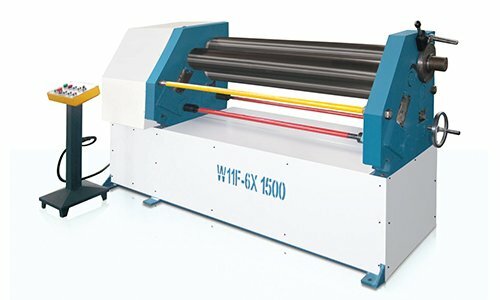 Roll bending machine can be divided into different types due to the use in different industries. From the number of rollers is divided into the three-roller bending machine and the four-roller bending machine. From the transmission, it is divided into mechanical and hydraulic rolling machine. 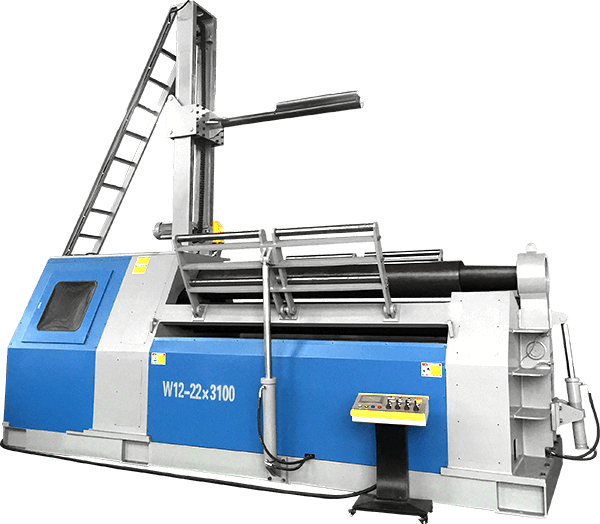 From the development of the roll bending machine, upper roller universal three-roll bending machine is the most backward, level down three roller bending machine slightly advanced, arc down rolling machine is the most advanced. 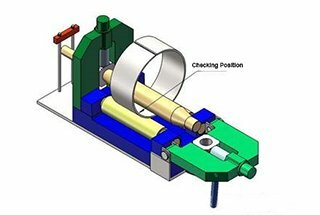 The mechanical three-roll bending machine is divided into symmetrical and asymmetrical. The structure of the machine is three-roller symmetrical. The upper roller in the center of the two rollers under the symmetrical position for vertical movements, through the screw to lead the worm gear drive. The two rollers for the rotary motion, through the reducer output gear and the lower roller gear meshing to provide torque for the rolled plate. The shortcomings of the machine are the end of the plate need other equipment to realize pre-bending. The machine structure is three-roll asymmetrical. The upper roller is the main drive, the lower roller makes the vertical movement. Through the lower roller gear and the upper roller gear meshing to clamp the plate. The side roller does the vertical movement, with pre-bending and round rolling function. It is featured compact structure, easy operation, and maintenance. Features of hydraulic three rollers symmetrical bending machine: the machine can do the vertical movement. It is realized by the hydraulic oil in cylinder drive piston rod. The lower roller for the rotation drive, through the reducer output gear meshing, to provide torque for the rolling plate. The bottom part of the roller has carrier roller and can be adjusted. The upper roller is in the drum shape, improve the straightness of the finished product, suitable for the tank with long size and various cross-shape. Up adjust symmetrical three-roll bending machine is able to roll metal plate into circular, curved and tapered shape within a certain range. The lower roller of the machine is the driving roller and the upper roller is the driven roller. 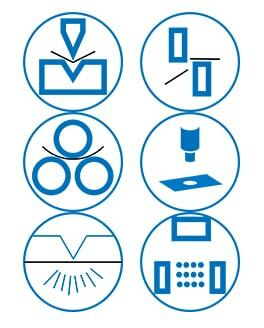 It is widely used in shipbuilding, boiler, aviation, hydropower, chemical, metal structure and machinery manufacturing industry.